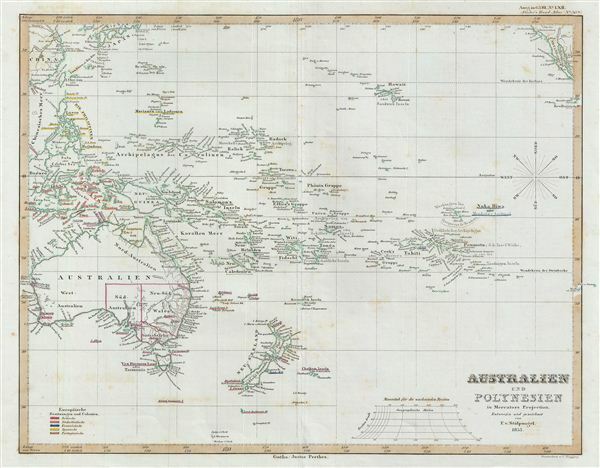 A fascinating example of the 1853 Perthes map of Australia and Polynesia. This map covers from Southeast Asia eastward as far as the Gulf of California, and from Japan Southwards to include all of Australia, Tasmania, and New Zealand. This map corrects many of the cartographic errors of the previous century and consequently most coastlines accurately rendered. Inland though, much remains confused and only tenuously explored. Vast stretches of unmapped territory and speculative cartography fill central Australia, New Zealand and Papua New Guinea. Political and regional borders are highlighted in outline color. Unlike other cartographic publishers of the period, the Justus Perthes firm did not transition to lithographic printing techniques. Instead, all of their maps are copper plate engravings and hence offer a level of character and depth of detail impossible to find in lithography or wax-process engraving. All text is in German. Designed and drawn by Friedrich von Stülpnagel and issued as plate no. 50a in the 1854 edition of Stieler's Hand-Atlas.